One of our favourite events in the calendar – 6th Form students and the Head of Graphic Design from The Grange School in Hartford, in the heart of Cheshire, are working with us again. The project? To respond to a creative design brief delivered by our Creative Director, Mark Bowers. It’s the time of year again when we welcome a selection of the most talented A-Level Design students from The Grange School in Cheshire. With the group at a crucial stage in their potential careers, both our Creative Director Mark Bowers and Managing Director Andi Parker believe in giving young, enthusiastic and talented designers the opportunity to apply those qualities to a real design brief. Mark will then choose a winner, who will join our studio for a week’s work experience in the summer. After the success of last year’s competition, Mark was really looking forward to meeting the new students and getting immersed in the project. Fresh from attending the “Can Graphic Design Save your Life?” exhibition, and before Mark briefed them on this year’s challenge, the students came armed with their favourite logo designs, and, in every case, a very thorough rationale to back up their choices. Here’s a selection of some of the students’ favourite logos, and why they chose them. Next up was Harriet Hill and the Apple logo: “I like its simplicity and I find the fact that they changed from the original colourful logo to a black & white version quite significant, perhaps it helps transmit the simplicity of their more recent designs”. Andi added to Harriet’s presentation by reminding students that when designing, print costs have to be taken into account: “It’s an issue that constantly comes up in the commercial world, clients will always ask about print costs, and of course it’s usually more cost-effective to print in black & white”, he said. Bryony Webb chose the WWF logo. 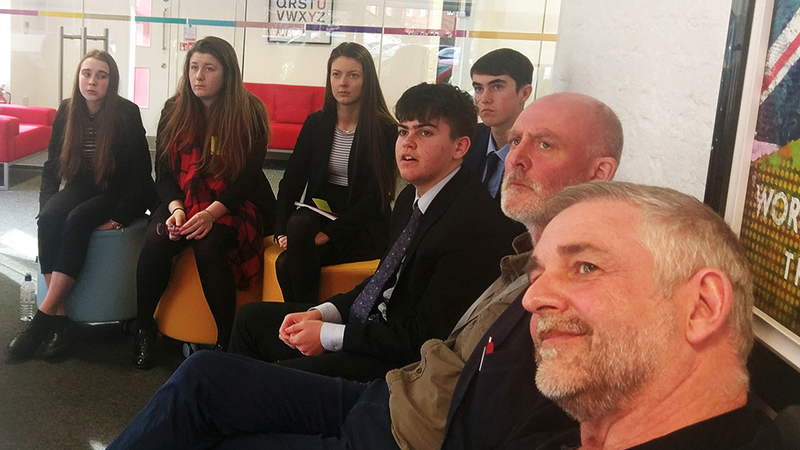 From right: Andi Parker, Parker Design’s Managing Director; Paul McAleny, Head of Graphic Design at The Grange School; and a few of the talented students taking part in this year’s competition. This year Mark asked the students to focus on design for Retail, specifically for the Healthcare industry. The Grange School team will need to come up with a snappy and memorable product name, branding, a strapline and packaging design for a new children’s medicine that relieves pain and fever. Mark went on to share some examples of branding for well-recognised children’s medicines, explaining how different visual features and product name choices help brands make a connection with their target audience and generate brand loyalty, thanks to combining the rational with the emotional, making a connection between a need and its solution. 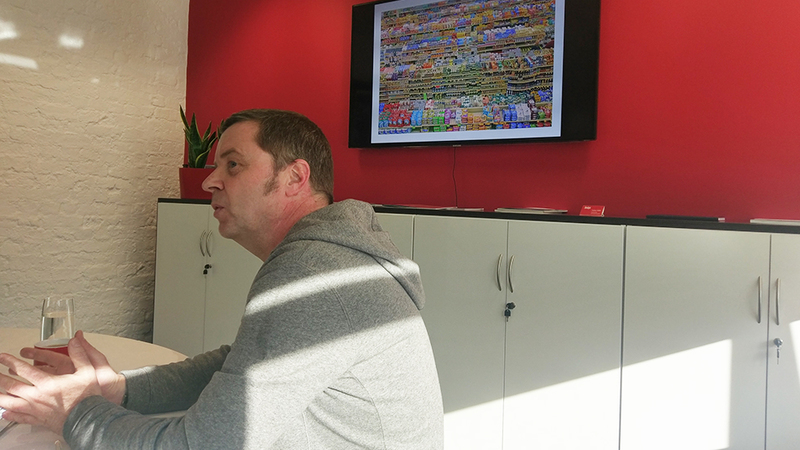 Before going back to school to kick off their designs, Andi took everyone on a tour of our Cheshire office. 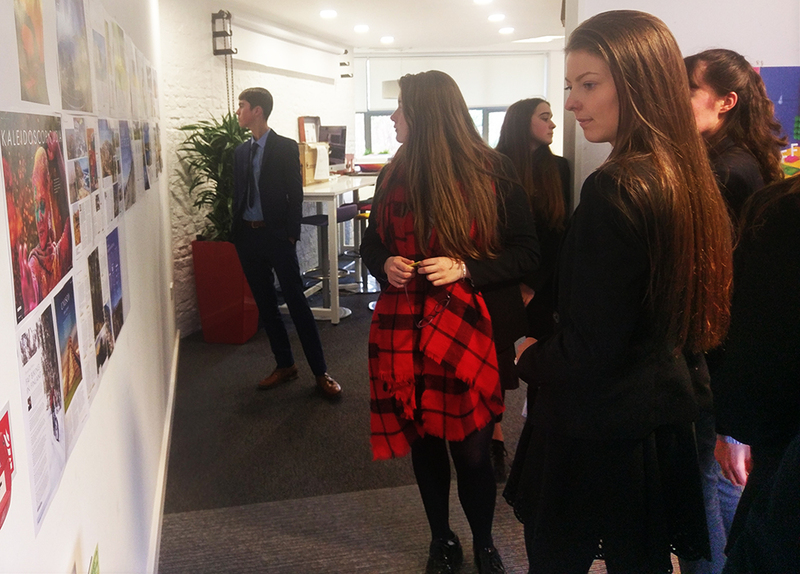 The students review the latest travel magazine designs we produced for our client Exodus. Good luck everyone, we’re looking forward to seeing your ideas!